Oh where to even begin with this gorgeous wedding? Chelsey and Brett’s elegant Homewood wedding was everything a stylish bride could dream of; a gorgeous, elegant ceremony in an austere setting paired with a crazy fun dance party, kicked off with a champagne tower! Chelsey and Brett traveled from Virginia for their big day and I’m so glad they did so I could meet them and photograph this amazing event! This wedding had so many special touches woven into it. To start with, Chelsey’s mom made, yes, MADE Chelsey’s wedding dress! Karen is an incredibly talented dress designer and she custom made not only the lovely bespoke wedding gown that Chelsey rocked on the big day, but her own MOB dress and getting ready robes as well! I could hardly believe my eyes when I saw them. Chelsey opted for not just a first look with her groom on their wedding day, but with her bridesmaids and her brother as well. The former was so fun and exciting, as all of her girls had been waiting to see that gorgeous dress! And her first look with her brother was especially emotional as their father passed away just a few years ago. The sweet moments shared between Chelsey, her brother, and her mom during that time brought tears to everyone’s eyes, including mine. And speaking of first looks, Chelsey and Brett had theirs on a roof! 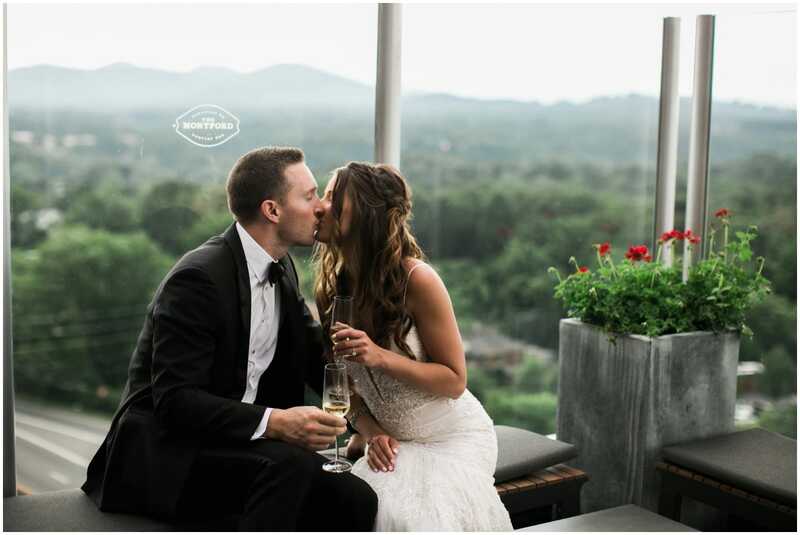 The Montford rooftop bar is positioned just perfectly overlooking the gorgeous Blue Ridge Mountains and I couldn’t have imagined a more gorgeous spot for them to see each other in all their wedding glory for the first time. And then they did what is fast becoming my favorite part of first looks; they took 15 minutes to just sip some champagne and enjoy being together. I snapped a few photos of that and then left them alone to enjoy their private moment. It was perfect. Their ceremony took place in the shadow of the castle, with gorgeous sunlight filtering through the trees. There was so much tears and laughter! And as Chelsey and Brett walked back down the aisle as husband and wife they were mobbed with tearful, joyful hugs from their family and friends. AND THEN THE PARTY STARTED. Y’all, these two know how to throw a PARTY. They kicked it off with speeches and a CHAMPAGNE TOWER and soon everyone was dancing the night away, hamming it up in their Key West themed photobooth (a nod to their hometown! ), and generally enjoying the heck out of the evening. Their magical sparkler exit was the perfect cap to my time with them on their wedding day!